What to Say to Father this Father’s Day? 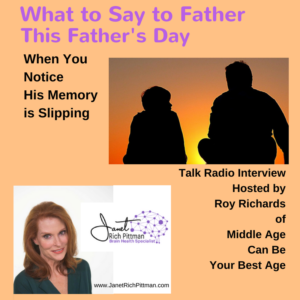 Internet Talk Radio Host Roy Richards of the show Middle Age Can Be Your Best Age took advantage of the Father’s Day holiday and questioned me about what to say to Dad when you notice his memory is slipping. Enjoy listening to our conversation [15 Minutes] (or you can read the transcript below) and let me know if you have any questions. Roy: On this Father’s Day, or perhaps later on this summer, do you have plans for extended visits with your father? Let me warn you and perhaps you’ll experience what I did with my dad a few years back. My father was a highly intelligent man, a former life insurance company executive, who also built a sizable common stock portfolio through personal investing and savings. But when he was in his late 80s, he started forgetting things and often would keep asking the same questions over and over again. And so like me back then, you feel like something needs to be done, but what? And here to help us answer that question is Senior Health Advisor and Dementia Prevention Specialist, Janet Rich Pittman. And you may remember, Janet Pittman was a guest on our February 27th program. And you can go back and listen to that interview at any time, because all our prior shows are archived. And she’s author of the brand new, five-volume e-booklet series titled “IT’S THERE, 5 Ways to Find Your Memory and Keep It.” And these e-booklet series may be a great medicine to you and me as well as to our parents. And more about it later, but first to refresh your memory, Janet Rich Pittman is a dementia prevention specialist known far and wide as The Brain Nerd, and her worthy mission is to help you and me and our aging parents to understand how to keep our memories, age gracefully and maintain good brain health. She’s Co-founder and Co-facilitator of the Alzheimer’s Dementia Support Group of South Alabama, and she’s the in-demand speaker nationally on all aspects of successful aging. And hello Janet, and welcome back to Middle Age Can Be Your Best Age. Janet: Hello Roy, it’s a pleasure to be with you. Roy: Well, let’s begin with our aging parents. What do you say to Dad or, for that matter, to Mom if that’s the case, if he or she begins to show clear signs of their memory is starting to slip way. What should you say? Janet: Wel Roy, I am gonna, maybe, put everybody on the sideline here, because I don’t think you should say anything. And I’m…sure everybody’s eyes are rolling. Roy: Yeah. Janet: You really want to do something, but the point is you really can’t. I mean, it has to be their decision. So, at first, of course you want to take in the effect that their memory is slipping and that they’re asking the same questions over and over again, yes. Roy: Sure. Janet: But, at the same time, no one likes to be scolded or reprimanded or pointed out their weaknesses, do they? So it needs to be… Roy: No, especially when it feels like someone else is picking on them. Maybe they are worried deep down about it and they certainly don’t want someone telling them or asking them. Janet: That’s exactly right. Janet: Especially your children, right? I mean, you have the domain over your children. Your children don’t have to the domain over you, right? So, of course, you don’t want them telling you what to do, especially your kids. Roy: So tell us one thing we can do is ask Dad a pivotal question. I have trouble saying that word for some reason, one designed to test his memory retention. Could you give us a couple of samples of like pivotal questions that we might ask, something that might just help, how well he remembers things? Janet: Yeah, you want to make sure though it’s his acknowledgement, to get him to acknowledge that his memory is slipping. So you would want to ask him a pivotal question like, “Dad, do you remember, you know, my son, Ryan?” which would be his grandson. “He hit that grand slam home run the other day. You were in the stands with me. Don’t you remember that?” You know, get him to acknowledge that he is forgetting. And once he acknowledges that, then you can say, “You know, Dad, I can help you. We can beat this, you know. Your brain is not in the best shape, it’s weakening a little bit, but together I can help you.” So it’s gotta be his idea, right? Roy: Yeah, that’s for sure. Well, let’s say that your dad or mom, though has been self-sufficient, is very proud and, maybe, very resentful of giving away control of any aspect of his life. He’s very evasive and won’t truly answer your questions, what are the two mains questions you could ask to prod for answers. I like things the way you lay them out. Janet: Oh good, thank you. You know, Roy, this happened to me last year with my father. And he was on some heavy medication. And they have a house on Mobile Bay, and we were all there for the 4th of July and we would all caught a bunch of crabs. He went out there to take a nap and we all had a bit crab boil. It was about two o’clock in the afternoon, and we’re hammering and all hollaring and of course, you know, with crab and outdoors, it’s hot, people are drinking beer a beer or two, and so their voices are a bit loud, you know. And you can just hear the clanking going on and everybody’s happy and all running and they have bunch on the picnic table, down under the house. And he comes down and just says, “What the heck is going on here? Why can’t you be quiet? You know I’m taking a nap.” And he storms off onto the pier and everybody is just completely silent. A couple of days later, you know, I come to him and I ask the pivotal questions like, “Dad, do you remember? Do you know what you just did or what you did a couple days ago?” And he acknowledged it, and I still note that, “I think it’s your medicine, let’s talk to your doctor and let’s talk about your medicine.” Then I said, “Dad, you’ve got to get a handle on this. You’ve got to get a handle on your emotions. Don’t you want to be around for your grandchildren’s graduation from high school? Don’t you want to be around when they graduate from college? Don’t you want to be around when they have the opportunity to get married and walk your granddaughter, maybe, down the aisle?” So those were the pivotal questions. Roy: So that is the incentive to work on and ask her/him and send them to get treatment or whatever they need. Janet: Exactly. Roy: It’s a great way to do it. Roy: Well, now for the $64,000 question. After your father takes ownership of his increasingly frequent memory lapses or states of confusion, are there steps he can take to lessen recurrence and get his brain healthy? And can you briefly describe a few ways to guide and assist your father to improve brain health? So is there anything you can do at that point? Janet: You know… yeah, there are basically four concepts that we need to help Dad get handle on and that is his nutrition. Because when you reach into the 80s or 90s, nutrition is so crucial and it’s so important. So we need to make sure we’re not eating any processed food. We need to make sure we’re eating good, healthy fruits and vegetables, a lot of healthy fruits and vegetables. Stay away from the white foods, the five hard white foods, the white flour, the white corn, the white potatoes, the white rice, and so we’re going to stay from… Roy: All that I love. Janet: Oh yeah. Well, that’s right you gotta get your brain right there, Roy, you know. You’ve got to make sure you’re eating for the right thing. So, of course, nutrition is number one. And then exercising, two types of exercising. You’ve got to do your basic physical exercise, need to walk six-seven days a week. You can walk 30 minutes a day every day or some sort of aerobic exercise. And then brain exercises, you’ve got to accomplish something new in your mind. You’ve got to be in a position to learn something new, to have an accomplishment with your brain. So you’ve got to exercise your brain, and it’s very important. If you create something new in your mind and follow something new in your mind, so then those two things… And then the forth item would be that you need to get your sleep. And you need to care about your community, your community being your family, your friends. And it’s what I call the four Cs to successful aging. You’ve got to care, connect, commit, concentrate. And those Cs are plural, and I put in the plural there for sleep, you gotta make sure you get some good sleep. The key point though is to make sure your dad understands that his brain is in not in the best of health, he’s got to get his brain very healthy, and the way to do that is through the nutrition and the brain exercising and also the physical exercising, but the point is he’s got to have the acknowledgment that he is gonna have to take over and take control of his brain health. Roy: Then he’s gotta have the incentive to do so, something to live for like that commitment or… Janet: Right, the four Cs, care, connect … Roy: you know walking the kid down the aisle or whatever it might be. Janet: Right. Roy: We have already passed through our middle age, especially in our 50s. A lot of our fathers, if they’re still around, are in the mid to late 80s, even 90s. Janet: Right. Roy: We just realize that our father’s memory is slipping isn’t it simply just a natural sign of aging and we really expect to restore healthy brain function in a person with a highly advanced age because it is really worthy effort. Janet: It’s so funny, Roy, today as a matter of fact, my next door neighbor, sent me an e-mail with that same question and she says”his memory is slipping and I’ve got him on supplement, I got him on multivitamin and some curcumin and vitamin D and magnesium. I have hired help for him and I’m doing all the grocery shopping. He’s eating clean. He is eating good. She’s helping him with his errands, and what do I do. Is there a pill? And, you know, can you can you refer me to a dementia doctor?” And I invited her over. We used to get together, right, for a glass of wine, but now we’re so healthful, so we get together for a glass of green tea. But, anyway, I said,”come over, this is too much for an email, but come on over and we’ll have a glass of tea,” and I’m gonna tell her that she needs to get her father in on an exercise program. Because when you get to your late 80s and since you’re not even, maybe into your early 80s, the old age dementia sets in, and if you don’t do something to the old age dementia, it turns into Alzheimer’s. Let me tell you it looks like all of a dementia, it’s just when your cellular brain cells that support your neuron shrivel up and then they are shriveling up and they’re not getting the nutrients into your brain to help you portraying the thought to continue. So what you need to do is exercise, that’s the way to beef up the nutrients and shoot them up into your brain. No, I’m not saying we need to go and run a marathon, Roy, but, you know, you’ve got to walk every day. You’ve got to get the body walking. Roy: You are speaking to the choir there, because I do that, I love to walk. I know my father walked a lot when he was elderly. So let’s talk a bit about your brand new five volume e-book web series, “IT’S THERE,” the subtitle is “5 Ways to Find Your Memory and Keep It.” Can you briefly describe maybe a couple of those five ways, so we can keep our memory sharp, and also help our aging parents to stay sharp and involve. Janet: I certainly will, and I have roughly pretty much already given them to you, Roy. You know the brain exercises, and the physical exercise, and the nutrition, and the four Cs. And so what’s kind of nice, though, about the book and what I think hopefully you would enjoy about that, is the fact that, you know, it’s not just another nonfiction book, it’s not just another how to book. It’s nonfiction inside a little fiction book and it’s about… Roy: I like the way you describe that. How and what does that mean exactly, nonfiction in a fiction book? Janet: Well, it talks about this woman. She’s in her late 50s, and she’s going through, you know, the juggles of a career and being a wife and a mother. And then her mom has Alzheimer’s. And she meets up with a friend, and she goes to a friend, and the friend is also a dementia administrator. And so she asks the administrator, “Help me, you know, what I do with my mom?” This is exactly what we’re talking about on today’s show, right? And this is exactly what… Roy: I like the way you put that advice into a story, that makes it so much more memorable, I think we can do that. Janet: Right, it’s just actually exactly what my next door neighbor was asking me. So the character in the story is asking those exact questions. So when you go through each booklet, they can be separate or they all run together and it just goes through and shows you all the different ways and gives you examples. Roy: Sure, so where is the best place to preview or purchase your e-book series? Do you have a website address they can go to, or where should they go for that? Janet: Yes, yes, absolutely. It’s just a PDF format and it’s all formatted, it’s really nice, in large print and you can go to my website, www.thebrainnerd.com and it’s on the front page right there, and it will show you how to get it. Roy: Oh that’s great. If there is one crucial message you’d like readers to take away from your e-book web series, what would it be? Janet: Exercise, exercise. Roy: Even with dementia, I would… Janet: That’s right. Roy: Yeah, well, as Father’s Day approaches or perhaps in the extended to summer vacation along with your elderly father and maybe your mother too, I highly encourage you to remain at all times vigilant as both our parents have enough aged over the years. Of course, both they and us will change and with early detection of Alzheimer’s and other forms of dementia, you do not have to rob Dad, Mom or ourselves, of a quality life and a healthy, well functioning brain. And today’s guest, Janet Rich Pittman, sent me a great little laminated bookmark and I’d like to conclude this program with the words written on it. And she says, “Dementia, especially Alzheimer’s or specifically Alzheimer’s is not a part of normal ageing. And no, Dad is not 100% certain to suffer from it as he grows old. And Alzheimer’s is a disease and should be treated as one. 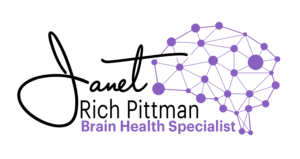 And Alzheimer’s begins to formulate in your brain 10 to 15 years before the symptoms ever manifest themselves and, perhaps most important, Alzheimer’s and other forms of dementia can be prevented. And if caught in the early stages, memory slippage can be reversed.” And before you spend a long, sleepless nights, worried about your dad’s forgetfulness or, maybe your own, go to Janet Rich Pittman’s website, thebrainnerd.com and preview her brand new, “IT’S THERE,” e-booklet series, and you will be amazed at the steps you can take and encourage Mom and Dad to take to avoid the ravages of dementia in your old age. And to get started, go to Janet’s, thebrainnerd.com website today. And God knows none of us want to spend our final days, months, even years lying in a bed in a nursing home, not even remembering who we are. And we don’t want our parents to have this bad phase either. And, thank you so much, Janet Pittman, for joining us today and for fighting so valiantly against dementia. Janet: Oh Roy, thank you so much for having me on your show. Roy: And best of success in your sale and distribution of “IT’S THERE,” your brand new e-book web series. And let’s all to go out and enjoy the heck out of summer and let us all defeat dementia. That’s it for today on Middle Age Can Be Your Best Age.